All vehicles are 2017 or newer & extended canopies. 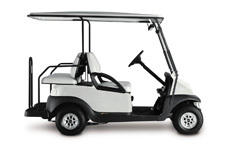 Most carts come with headlights, tail lights, and fold-down rear seat. Call your local store for a special quote for any long term rental or lease.